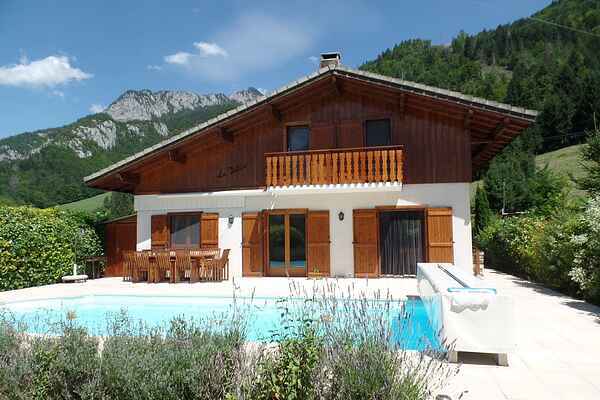 Luxurious holiday home with comfortable furnishings in the ski area of ​​the Porte du Soleil mountains. No sense in winter sports or a summer mountain hike? There is also a private swimming pool, overlooking a phenomenal sunset. This is the ideal location to relax on one of the sun beds or dine on the wooden table under the canopy during the sultry summer evenings. The house is located in a charming hamlet with a few other houses, near the charming village of Le Biot. In the region you can make lots of nice trips. Around the corner is one of the most beautiful Gorges of France; the Gorges de Diable (5.4 km). In the Lac de Jotty (6 km) you can swim in the clear blue mountain water and relax on the grass. The bustling Morzine (8 km) is known for the cozy terraces and active excursions such as mountain biking, organized walks with a guide and a trip to the top of Avoriaz with the cabin lift. To get into completely different spheres, you can spend a day in Switzerland on the immense Lac du Léman (20 km), better known as Lake Geneva. This holiday home is fully wheelchair-adapted and therefore suitable for the disabled. There is also a hoist for the swimming pool.